The Pensacola Blue Wahoos picked up a 5-4 win over the Jacksonville Jumbo Shrimp on Wednesday evening, using three home runs and seven extra-base hits in the opening game of the newly-announced Seafood Buffet Series. Jorge Alcala started on the mound for Pensacola and provided a strong outing, going 5.0 innings and allowing two runs on five hits while striking out four. The Blue Wahoos took an early lead on a towering home run by Drew Maggi to left leading off the second inning. Following the homer, the next two hitters, Brian Schales and Jimmy Kerrigan, each doubled to put Pensacola up 2-0. The Wahoos extended their lead to 3-0 in the fourth on a solo shot by Schales to left. Jacksonville battled back into the game in the fifth, using a double, sacrifice, hit by pitch, RBI groundout, and RBI single to score twice and cut Pensacola’s lead to 3-2. 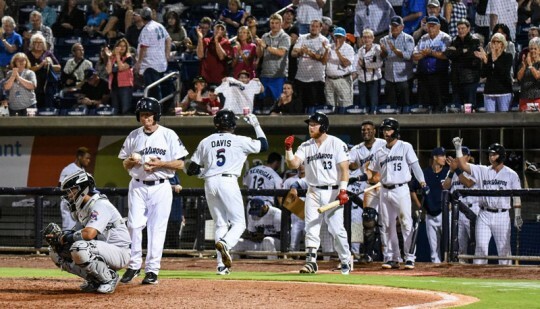 The Blue Wahoos answered in the bottom half of the inning with their third home run of the game, a solo shot to left by Jaylin Davis. The two teams traded runs in the seventh. 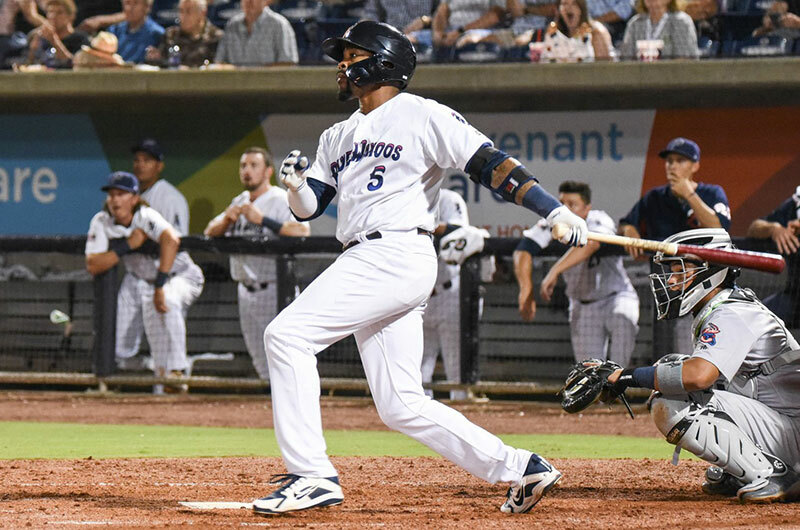 Jacksonville loaded the bases against reliever Jovani Moran, who then hit a batter to plate a run and pull the Shrimp within one. With the bases still loaded and just one out, manager Ramon Borrego turned to Jeff Ames out of the pen, who proceeded to strike out the next two hitters to escape the jam. It was Schales again in the bottom of the seventh helping Pensacola to answer, drilling a two-out double to score Davis from first and put the Wahoos up 5-3. With one out in the eighth, Jacksonville put runners on the corner with just one out against Ames. The Wahoos turned to Ryan Mason, who retired the first batter he faced on a ground out while a run scored, making it 5-4. With a runner on second, the following batter Bryson Brigman knocked a single to left that looked like it would tie the game, but Pensacola leftfielder Ernie De La Trinidad made a perfect throw home from the outfield to gun out the runner at the plate and save Pensacola’s lead. 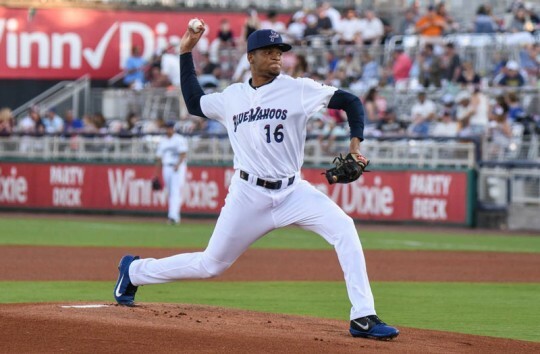 Mason set the side down in order in the ninth, striking out a pair, to earn his first save of the year and give Pensacola a 5-4 win in their home opener. Alcala (2-0, 1.80 ERA) earned the win while McKenzie Mills (0-1, 7.20 ERA) was saddled with the loss. 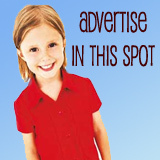 The two team’s will continue their five-game set at Blue Wahoos Stadium Thursday.